You could compare candidate for Mayor Anthony Becker’s online campaign to the new TV season. And you could call that of his opponent, Sitting Mayor Lisa Gillmor, reruns from the 2016 season. A professional videographer, mayoral candidate Becker hasn’t been shy in attacking opponent Lisa Gillmor’s record on Twitter, Facebook and his YouTube channel. Becker goes hard against Gillmor’s history and isn’t above tweaking her nose, for example with his “Becker Territory” video, filmed on Monroe St.
Becker’s “The Truth About My Opponent,” is a 40-minute documentary about Gillmor’s record in her 16 years on the Santa Clara City Council, including her role as chair of the committee to bring Levi’s Stadium to Santa Clara, with video of Gillmor hugging Jed York after Measure J passed. 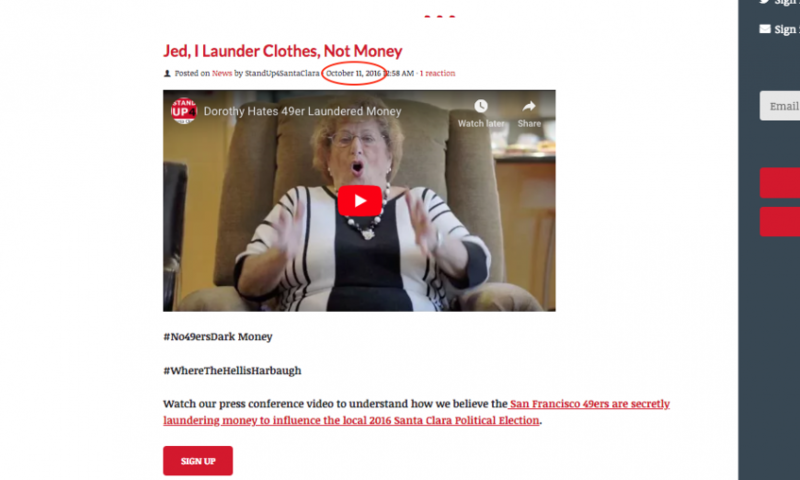 Becker also includes video from the Measure J campaign, highlights of the 2016 election and Gillmor’s partnership with the developer-financed Santa Clara Police Association PAC, her witch hunt against the 49ers, her attempts to sow confusion and misinformation about Levi’s Stadium and her seeming efforts to present it as a money-loser rather than the money-maker she promised when she was campaigning for it. By contrast, Gillmor is still relying on the same methods, arguments, messengers and even the same material she used in 2016 when she was campaigning for her slate of candidates. Gillmor’s two principal social media are proxies go back to the 2016 campaign: fired Weekly sports writer and blogger Robert Haugh and Haugh’s amplifier, Stand Up for Santa Clara, both of which recycle the character assassination, insult and conspiracy-mongering. 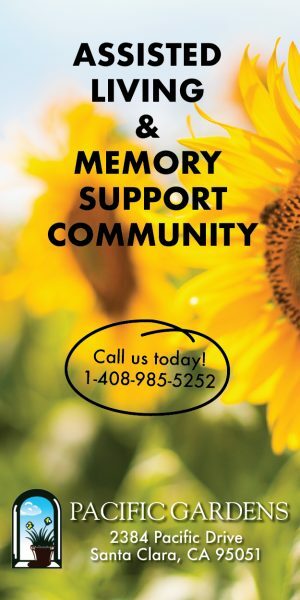 Back in 2016, Gillmor and Council Member Teresa O’Neill provided the impetus for launching Haugh’s blog, according to messages in the Weekly’s possession. Gillmor introduced Haugh to her political pal Related consultant Jude Barry as a possible financial backer, according to those messages. Formerly, Haugh was a leading proponent of Levi’s Stadium, but now says he only wrote his 50-plus fawning articles for the Weekly about the stadium because he was told to. Stand Up is run by Gillmor’s online campaign consultant, Santa Clara Youth Soccer League VP and past president Gabe Foo and another Soccer League perennial board member, Burt Field. Soccer League president and Gillmor ally Tino Silva was a co-founder, with Foo, of Stand Up. The site reliably promotes whatever appears in Haugh’s blog. For two years Haugh and Stand Up have been trying to resurrect the dark money PAC, BLUPAC as an issue. BLUPAC’s inept attacks were exceptionally effective as a straw man for Gillmor’s slate of candidates that year. Since August, Haugh and Stand Up have been trying to resurrect the two-year-old story. Instead of answering Becker’s arguments, Haugh insults him and sneers at Becker for formerly working at Target. Becker says Haugh has repeatedly called Becker’s current and former employers trying to get personal dirt on Becker. Last week Haugh re-directed his attacks to District 2 candidate Raj Chahal, who is running against Gillmor-endorsed Nancy Biagini. Chahal is widely known for his community activism and is well liked. He has been a consistently active volunteer to the Santa Clara Sister Cities Association for many years, and started the first Sikh boy scout troop in California. Many might find it hard to attack Chahal’s “mom and apple pie” record, but Haugh found a video made by young members of the Sister Cities talking about Chahal’s work with the group. This, proclaimed Haugh, constituted political manipulation of a non-profit by one of its officers. Haugh has made no such objections to the tasteless video, Let Me Tell You a Story About a Man Named Jed, made several years ago by young players in the Santa Clara Youth Soccer League — also a non-profit — and still in circulation on Facebook. The video was reportedly scripted by one of the player’s parents. Over the weekend she also added another rerun to the lineup: an edited 2016 video featuring devoted Gillmor follower Dorothy Rosa. Once described as “a passionate 49ers fan” by the Mercury in 2014, Rosa played the lead in the debut of “laundry,” Gillmor’s 2016 anti-49ers political theater on the City Hall steps where Rosa threatened to deliver a bag of dirty laundry to 49ers headquarters. The reference is to Gillmor’s strident accusations, beginning in 2016, that the 49ers were trying to “take over our city” by laundering money through BLUPAC. Gillmor has never presented evidence for her accusations, nor has anyone else ever found any, despite Gillmor’s repeated claim that there was “compelling proof.” BLUPAC’s visible funding came from the San Francisco Police Officers Association Issues PAC. On Tuesday, the voters will choose: reruns or a new show.